In Georgia, unemployment is high, and it is higher among women than men. Policy changes are definitely needed not only to increase the employment opportunities, but also to ensure more equal employment opportunities for men and women. However, survey findings show that changes in Georgians’ attitudes towards gender roles are no less needed, as the population does not always support the idea of women having paid jobs – especially so, when they have young children. This blog post looks at what the population of Georgia thinks about working mothers and their ability to care for their children. Women’s employment can be beneficial for families and societies in many ways. The potential benefits for children when they have working mothers were recently described in an article published by the Harvard Business School. The findings of a cross-national survey covering 24 countries suggest that it is good for children under the age of 14 if their mothers work, instead of staying at home full time. The study showed that the sons of working mothers are more caring for family members compared with the sons of stay-at-home mothers. Probably more importantly, daughters raised by working mothers had greater career success and more stable relationships than the daughters of stay-at-home mothers. Other studies indicate that the relationship between women’s attitudes early in life towards gender roles and their later employment is recursive: “women’s early gender role attitudes predict their [adult life] work hours and earnings, and women’s work hours predict their later gender egalitarianism” (Corrigall and Konrad, 2007). 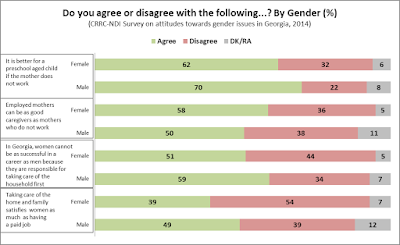 In October 2014, CRRC-Georgia conducted a nationwide public opinion poll for the National Democratic Institute (NDI) on attitudes towards gender issues in Georgia. A representative sample of 3885 respondents was interviewed in order to explore their attitudes towards women’s participation in society and politics as well as ideas about how to improve women’s position in society. The survey’s results indicate that female unemployment may not be considered a serious problem by Georgians, because women are believed to be capable of self-realization even if they do not have a job. Moreover, unemployed mother’s children are believed to be better off compared to the children of employed mothers. 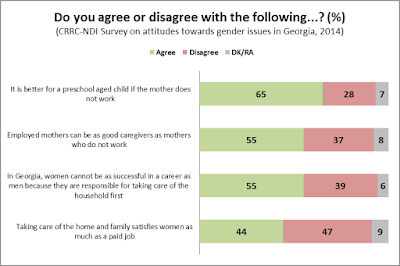 The chart below shows that 65% of Georgians believe “It is better for a preschool aged child if the mother does not work” and a smaller but still considerable share (37%) is more radical, disagreeing with the opinion that “Employed mothers can be as good caregivers to their children as mothers who do not work”. Over half (55%) of Georgians think that because of household responsibilities, women cannot be as successful in their career as men, and just below half of the population (44%) think that “Taking care of the home and family satisfies women as much as a paid job”. Exploring these findings by gender shows that women are less likely to share traditional views regarding gender roles. Women are especially critical of the opinion that “Taking care of the home and family satisfies women as much as a paid job”, and 54% of Georgian women disagree with this opinion compared to 39% of men. It is also noteworthy that men have slightly but consistently higher rates of answering “Don’t know,” or refusing to answer these questions, which might mean that they are not really aware of women’s preferences and abilities when it comes to work-family balance. Exploring the data by age shows that there is a tendency among young people to hold slightly more egalitarian views on gender roles compared to the older generations. Those who are 56 and older are less likely to think that “women and men equally need a job to feel self-realized,” than their younger fellow citizens. To sum up, the data suggests that the higher level of women’s unemployment in Georgia compared to men’s may be caused, to a certain extent, by public attitudes towards gender roles. 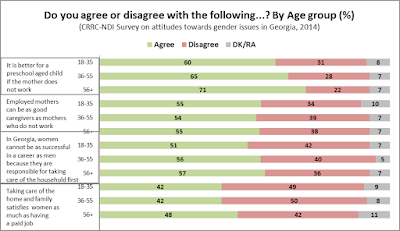 The good news is that women and young people share more egalitarian views, suggesting that the vicious circle between attitudes towards women’s employment in Georgia and their actual employment may have already started break down. To take a deeper look into the data, explore it on our Online Data Analysis tool.